Observation data collected by Japan’s lunar orbiter Kaguya has shown that a cave stretching some 50 km (over 30 miles) exists on the moon that could provide shelter for astronauts in the future, this according to the Japan Aerospace Exploration Agency (JAXA). 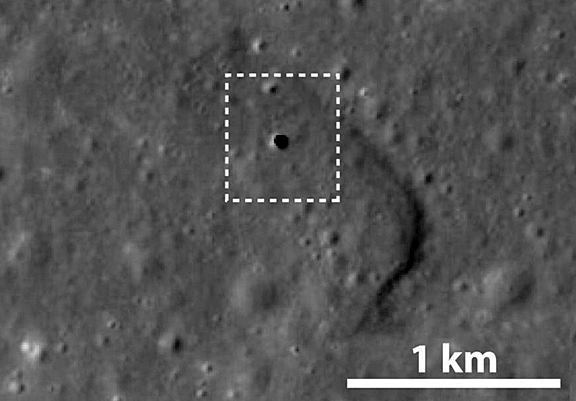 This undated satellite photo taken by the lunar orbiter Kaguya reveals a 50 meter hole on the moon's surface that leads to a 50 km-long cave. Image is courtesy of JAXA via KYODO. The cave could protect astronauts from radiation from the sun and cosmic rays when they build a base for exploration, the agency said. The cave, believed to be a lava tube created about 3.5 billion years ago, sits beneath an area with a group of volcanic domes called the Marius Hills, JAXA said. The lunar orbiter initially found a hole about 50 meters in diameter and depth. Further surveys of the area with radio waves discovered the lava tube.